Poulan Pro Weed Eaters offer the newest and most innovative accessories and features at very affordable prices. Powered by a 25cc 2 cycle “Sure Fire” motor there’s plenty of power for the 17 inch cutting line (or blade). Lightweight at 15.8 lbs the unit is easy to assemble out of the box, easy to start, and relatively quiet for a gas powered trimmer. With it’s split boom straight shaft, the Poulan Pro can be turned into 6 different tools for whatever you need: a string trimmer, an vertical edger, leaf blower, cultivator, high reach pruner, and even a heavy brush cutter. The straight shaft has a 17 inch cutting diameter allowing the operator to cover larger areas at a faster pace. Perfect for mowing lawn sections when a traditional mower will not work. The 25cc 2 stroke gas powered engine provides a great amount of efficiency and power through the use of two piston rings that allow for increased compression. That means that despite being a relatively inexpensive and lightweight weed-trimming tool, the Poulan Pro String Trimmer is also powerful. Powerful low emission two cycle25cc engine designed to provide efficient weed cutting power without sacrificing fuel efficiency. Extra Long Straight Shaft. The straight shaft is perfectly suited for getting in tough-to-reach locations underneath terrain obstacles. Lightweight. Coming in with a shipping weight of 15.8 pounds. it is light enough for most users to comfortably operate. Durable Construction. 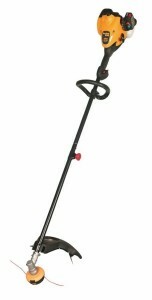 All of the parts, mechanical and otherwise, of this gas powered weed trimmer are highly resistant to damage. It is a very sturdy outdoor tool that can withstand both the elements and the materials that you will be cutting with it. Anti-Vibration Handle. To make long bouts of weed trimming easier on the body, the handle is designed to reduce the effect of the vibrating motor, making it much easier to use the device for long periods of time without getting tired. This weed trimmer is a light, inexpensive investment that offers a big return on your gardening capabilities. The extra-long handle is a great asset for hard-to-reach weeds and other plant material that may have worked its way into unexpected places. The powerful engine of the Poulan Pro is a great asset and one that is sure to come in handy for any gardener or landscaper who is looking for power without breaking the bank. However, it is not CARB compliant. Other features include a durachrome cylinder and automatic clutch for extended engine life, an easy to use tap and go trimmer line replacement, and Poulan Pro’s “Sure Fire” starting technology that lt’s the user bypass having to choke the engine. Poulan Pro has an excellent reputation for quality power tools. With their 2 year warranty and a price tag under $120.00 this model is easy to recommend.